Will I See You at the RWA Conference in Orlando? Are you going to the annual Romance Writers of America’s (RWA) conference this year in Orlando? I’m super excited to be there the entire week of July 24. If you’re planning on attending, let’s catch up. I’ll be promoting my two paranormal series, The Red Plague and The Dark Caster, with postcards, pens, and temporary tattoos in the goody room. I’m really looking forward to re-connecting with my writer friends and learning a lot from the panels. Or, My Conference SWAG Arrived And I Want To Share! I’m so excited to attend both Comic-Con and Romance Writer’s of America’s national conference (I can’t stop smiling! ), I ordered new promotional goodies. 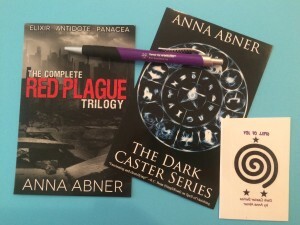 If you’d like to receive the pictured loot, send me an email at anna@annaabner.com or leave a comment on my blog and I’ll ship a personalized care package to the first 10 responders. Good luck! My goody bag includes two postcards, an adorable purple pen, and a Spell of Joy temporary tattoo. My 1st Newsletter is Coming Your Way on Friday! My inaugural newsletter is posting Friday, Sep. 13. Sign up on this form to be involved from the ground floor. 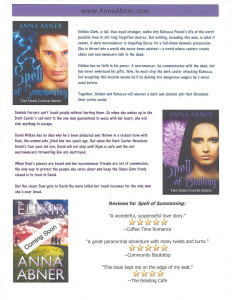 I’m so excited to be able to share new projects, updates, and all the fun things going on at AnnaAbner.com with you. I made this myself (miracle!) 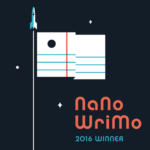 to take to the RWA national conference and publicize my published works, and I’m so proud of it I wanted to share it with you. Readers prefer ebooks to paperbacks. Most readers purchase their books from Amazon. Readers find new authors on Facebook. Most readers don’t look at the bestseller lists to find books to read. What do you think about these results? Do they represent you as a reader? 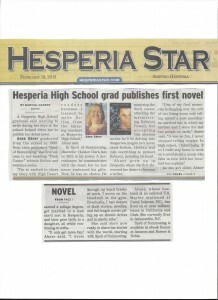 I didn’t think anything would come of sending press releases to my local and hometown newspapers, but I’m thrilled to say my story was reported in the Hesperia Star Newspaper in my hometown of Hesperia, California today. Link to the online version here. Here is a photo taken by a fan in Hesperia. I’m a new indie author with a book to promote, but I don’t have a lot of money to spend on marketing. So, I’m all about free easy ways to get my name and novel out in front of a lot of different people. Here is a list of things (in no particular order) that have worked for me. I’m assuming you have a website or a blog already set up. 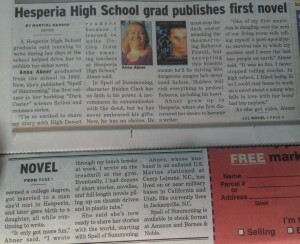 Write a press release with a “local girl (or boy) does well” spin and send it to your hometown newspaper. Reach out to book clubs and offer your novel for them to read. Be prepared to visit the group for a Q&A. Set up an author page on each of the sites you publish on. And don’t forget Goodreads! Write an article and be the guest speaker on a blog. 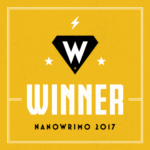 Invite other authors to guest on your blog. Write interesting and topical blog posts at least three times per week. 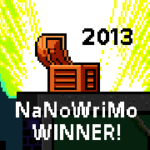 Post an interview with another new, indie author on your blog. Ask if they will reciprocate. Give away a free copy of your book through your site or on Facebook. Publish your novel on other sites besides Amazon, like Barnes and Noble, All Romance eBooks, Smashwords, Lulu, and CreateSpace. Become an expert in social media. Blog, Facebook, Twitter, LinkedIn, Pinterest, Tumblr, Google+, etc., etc. Launch any new blog series, event, and definitely your latest book release with social media fanfare. Comment on popular blogs in your genre. 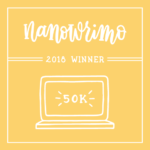 Get your novel reviewed by popular book bloggers. If it’s a positive review, use it as free advertising on your site and your author pages.